What does the future look like? No one knows and it is folly to argue one does. But we can think, we can even try to make predictions, depending on how much risk we are willing to take. To say, as Jeremy Rifkin suggests, that the future will look like a collaborative commons, based upon zero marginal cost, internet-linked nodal, laterally scalable shared green energized economy is all very well, and I definitely resonate with it, but is it inevitable? How zero cost is it? The price of generating an extra energy unit from a photovoltaic panel may be close to zero, but what about the panel itself? Who pays for it? Proponents will say that photovoltaic panels are cheaper than they have ever been, huge economies of scale were possible in the last few years and any person these days can purchase photovoltaic panels. But is this true? Panels are cheaper than they were some years ago, no doubt, but a person first needs to eat, have a shelter, access some basic form of transportation and energy for cooking, lighting and such. Only after all that is guaranteed, can someone consider the photovoltaic panels, the electric car, or the 3D printer. The “future”, it seems, will not come until poverty is eliminated. Because poor people – 24.4 % of all European population was at risk of poverty in 2014, or 122 million people – cannot participate in this futuristic vision of the world unless their basic needs are met. You doubt it? Then think about it. In most places, if you run out of money to pay for electricity, it is unlikely that your neighbors will help out by supplying you with some electricity, and even less likely that you will be given a photovoltaic system to produce your own energy. Where I live, at least, if I stop paying the electricity bill, they will cut me off, without a doubt. No matter how generous, how educated, how creative, how tolerant I might have been in life, the power company is completely indifferent: you do not pay, you will have to go without power. Period. Things might be different in the future – and they certainly will. But at this moment the amount of money one has is less related to levels of education, generosity, creativity or tolerance, and more to status, power, social networks, dominance and violence. Attributing monetary value to people is a trap. The instant you say “this person is worth 1000 euros”, you automatically create an underclass of unworthy people. Those people might even be subject to discrimination and violence you object to, from deprivation and poverty to constant surveillance. So definitions or layers of worthiness cannot solve a core problem in present-day human species: our difficulty to share. To trust. This is why I defend basic income. It represents a bold and clear statement: human dignity is not and must not be subject to discussions about worthiness or value. These attempts to quantify human beings are bound to fail, since our “value”, if we must speak of it, is incalculable. You cannot calculate it, so there is no use in trying. Basic income is also a crucial tool for participation. You cannot truly participate and contribute to a better society – let’s say by investing in a photovoltaic system – if you do not have the money to meet your basic needs. This is why major societal challenges like climate change cannot be solved without addressing poverty. Because while there is poverty, people will simply not “do the right thing” when they cannot afford it. If the costs of living in a more sustainable way are higher than what they can afford, there is little choice but to eat whatever they can, buy the cheapest power appliances and drive the most affordable vehicles. And all these are still among the major polluters we are trying to eliminate. 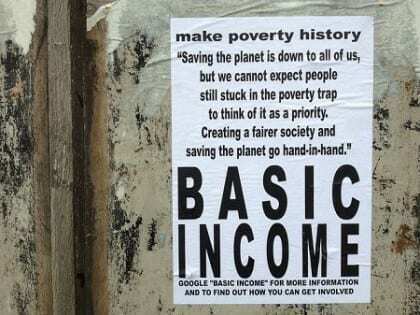 Hey Andre, I also support Basic Income. I wonder if you could cover crime and police brutality, how these would be affected. I think a more egalitarian/fair society leads to more trust in our system and less crime, and also less need for active policing, but I haven’t seen anyone in the media making that case. Thanks. Also, I think if we don’t have some kind of maximum income as well, then I am concerned that inflation can be used to make the minimum meaningless. You can check out this Scott Santen’s article: http://www.huffingtonpost.com/scott-santens/universal-basic-income-wi_b_8354072.html. The only way a Basic income can be funded is by opting for an elective Third Industrial Revolution to shift from an Industrial Economy to a Network Society (the next stage of economic development). USA WIsdom Network crowd creates the next stage, prosperity and a ‘Minimum Life’ (or Basic Income) and is available at http://www.wisdomnetworks.im/usa .